Context: Infection control is an important concept in the present day practice of dentistry. Disinfection of dental impressions is part of the daily routine in a dental clinics. After disinfection, it is important that impressions remain dimensionally stable. Aim: The purpose of this study was to compare the effect of chemical disinfectants and ultraviolet (UV) disinfection on the dimensional stability of the polyvinyl siloxane impressions. Objectives: The objective of the study is (1) To evaluate the effect of chemical disinfectant (2% glutaraldehyde and 1% sodium hypochlorite) and UV disinfectant on the dimensional stability of polyvinyl siloxane impression material. 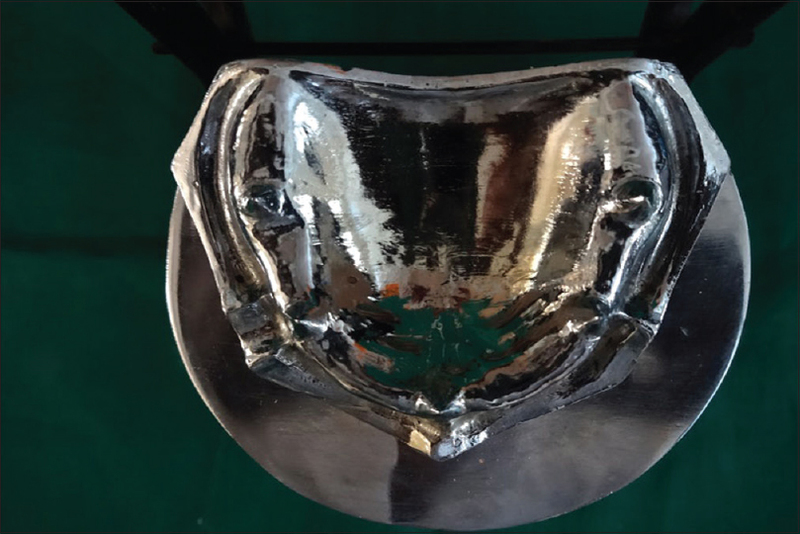 (2) Comparative evaluation of the dimensional discrepancy between the cast poured from the polyvinyl impressions material, that is subjected to chemical disinfectant and UV disinfectant to that of cast poured from impressions that were nondisinfected. Materials and Methods: A customized tray was fabricated to make impressions. Impressions were divided into four groups, 10 samples were disinfected with 2% glutaraldehyde for 20 min, 10 samples were disinfected with 1% sodium hypochlorite for 20 min, 10 samples were disinfected with UV light for 20 min, and 10 samples were not subjected to disinfection which served as control group. All the samples were poured after 30 min in die stone. Measurements were recorded using traveling microscope of 0.001 accuracy. Statistical analysis used in this study was the one-way ANOVA test. Results: The result showed significant dimensional changes in samples disinfected with 2% glutaraldehyde and 1% sodium hypochlorite, whereas samples disinfected with UV disinfectant unit showed no significant dimensional changes when compared with control group samples. Within the chemical groups, impressions disinfected with 1% sodium hypochlorite showed more discrepancy in the dimensions when compared to the 2% glutaraldehyde disinfected group. Conclusions: UV light disinfectant can be safely used to disinfect impressions as compared to chemical disinfectants in clinical prosthodontic procedures. Infection control in dental clinics and laboratories has become an important concern in recent years due to the increased risk of cross-contamination with diseases such as HIV and hepatitis B. 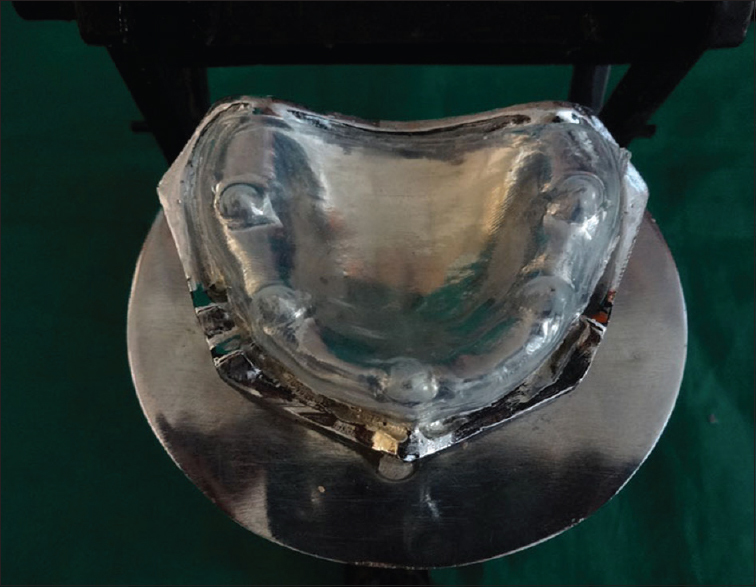 The impression is the prototype of the victorious results of restorations constructed over it, but concurrently, this impression material may conduct microorganisms and may transmit infectious diseases from patient to dentist and laboratory technicians. The hazard can be reduced by disinfecting the impression before they are sent to the laboratory. The number of physical and chemical methods has been proposed to disinfect dental impressions. Physical action yields an increase in temperature, resulting in a distortion of impression materials, and hence chemical disinfection is believed to be the simplest and effective form of infection control. In recent advances, ultraviolet (UV) radiation has become an efficacious way of inactivating microorganisms as they are effective in killing the microorganisms and the bacterial spores while preserving the quality of material. Disinfection should not compromise the integrity of the impressions and is a necessary component for successful treatment. And, hence, an in vitro study was conducted for comparative evaluation of the effect of chemical disinfectants and UV disinfection on dimensional stability of the polyvinyl siloxane impressions. A cross-sectional study was performed in 1 year from May 2013 to May 2014 at Sharad Pawar Dental College and Hospital after the ethical clearance from the Institutional Ethical Committee (DMIMS (D U)/IEC/2013-14/846). Forty samples were fabricated for the study. Dental Vacuum forming machine (Dentsply Raintree Essix). Each group with 10 samples. Group D-Disinfected with UV light – 10 samples. Sample Disinfection – 10 samples were not subjected to any disinfectant that served as a control group. 10 samples were disinfected by immersing in 2% glutaraldehyde for 20 min. 10 samples were disinfected by immersing in 1% sodium hypochlorite for 20 min. 10 samples were kept in the UV chamber for 20 min. 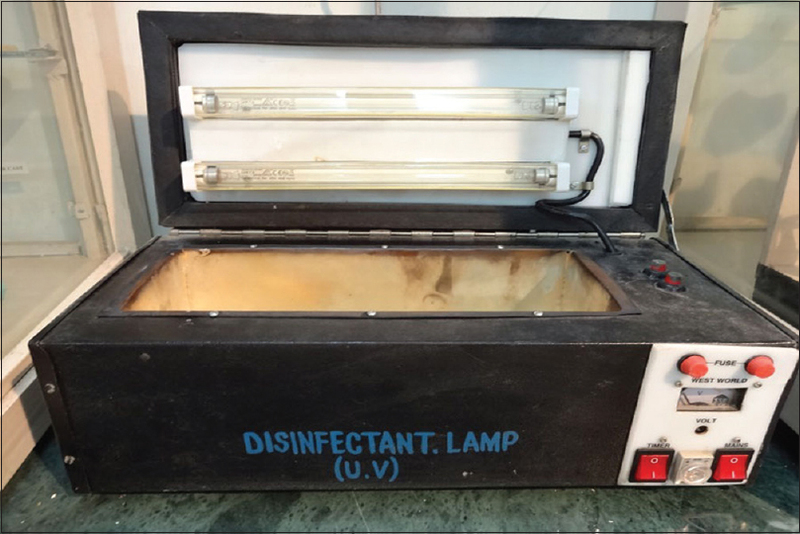 Shoe box-shaped UV disinfection unit consisting of an outer body and inner body was used for the study. The outer body is lined with a sheet comprising of galvanized tin. The dimensions of this sheet are 455 mm × 200 mm × 160 mm inner box where impressions are to be placed for disinfection are of dimensions 125 mm × 325 mm × 125 mm. It is fabricated from copper and is coated with silver. Two UV tubes with 8 watts of power, 2.5 watts of output, 254 nm wavelength, 1-foot length, and 6000 h of life were fitted on the inner box at a distance of 10 cm from the floor where impressions to be disinfected will be placed (Sankyo Denki Co Ltd, Japan) [Figure 8]. A voltmeter was attached in the inner box to record the volt of the UV lamp. For monitoring, the time clock was attached and was set between 1 and 60 min. Cast preparation - The cast were obtained from the impressions in die stone. For Control Group (Group A) impressions were poured after 30 min and for disinfected groups (Group B, Group C, and Group D) the impressions were disinfected after 10 min in respective disinfectant for 20 min and were rinsed and dried and poured immediately. The die stone was allowed to set completely before retrieval of the cast [Figure 9]. Inclusive criteria were, the cast poured in die material from the elastomeric impressions material. All the cast that failed to reproduce the references points due to errors at the time of manipulation of impression material or at the time of pouring of the cast were excluded from the study. Measuring linear dimensions on the cast - After the final set, the cast was retrieved. The traveling microscope of 0.001 mm accuracy [Figure 10] was used to determine the linear measurement between BC, DE, DC, BE, AD, and AE references points. The statistical analysis of this in vitro study revealed that there was no significant difference in the arthematic means for the measures of different points in the impression between the Group A (Control Group) and Group D (disinfected with UV light). However, statistical analysis showed the difference in dimensions of an impression of Group B and Group C with that of Group A (Control Group) (P < 0.0001, S). 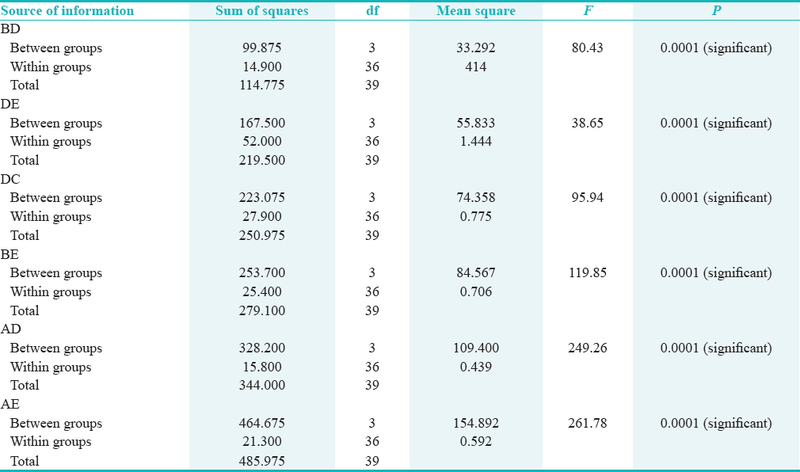 Moreover, the Group B showed more significant P value when compared to Group C to the Control Group [Table 1] and [Table 2]. The disinfection of impressions is a fundamental procedure in the routine dental practice. However, still “handling of dental impressions” has been paid with little or no attention and is a potent source of carrying diseases. 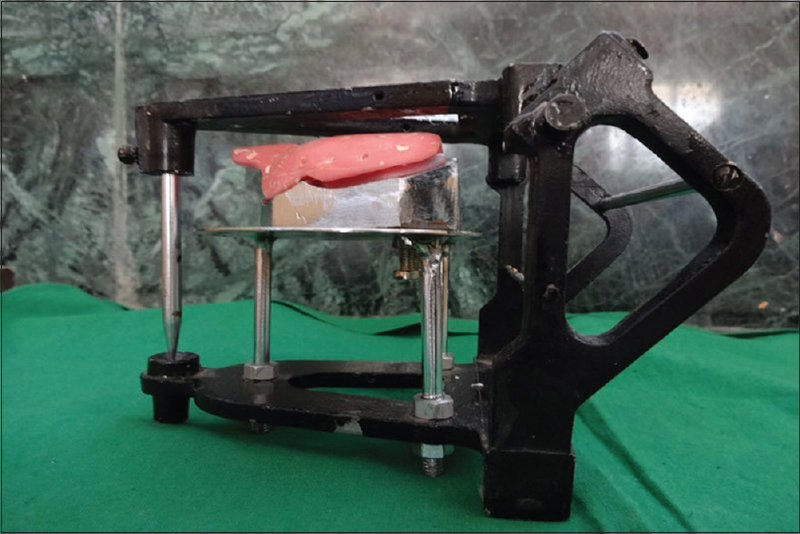 Leung and Schonfeld, observed the transfer of microorganisms from the impressions to the plaster casts, leading to contamination of the laboratories of dental prosthesis. And, hence, the impressions must be considered fomites with the potential to transmit the diseases. Because of apprehension and distress about the infection control, disinfecting the impressions has become a cardinal issue in clinical practice. Pleasure et al. 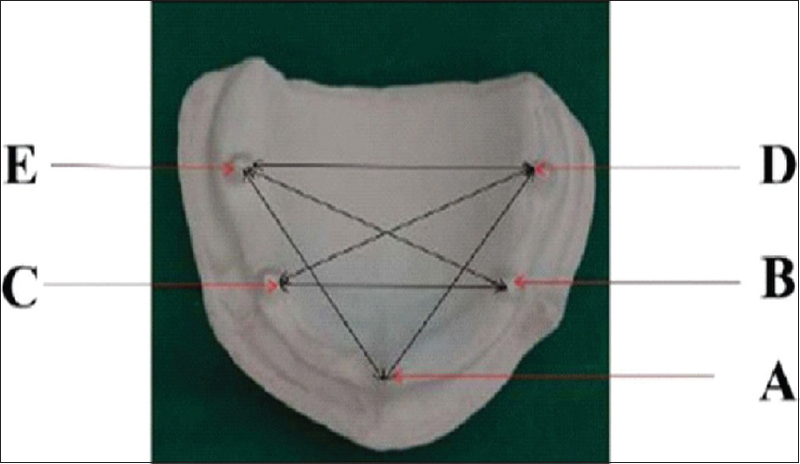 concluded in his study that sterilization distorts the impression materials as it is a thermoplastic in nature. And therefore, disinfecting the impressions with the chemical disinfectant is recommended. All impressions materials cannot be disinfected by single disinfectant due to different properties of different materials. The addition silicon is hydrophobic it does not absorb water and does not expand on immersing in disinfectant. Merchant stated that disinfection with immersion method had more advantages than other disinfecting methods. Rios et al. stated that many dentists avoid disinfection of impressions by immersion and prefers to aerosols. However, the aerosol treatment of an impression was not found to be effective in the destruction of microorganisms as the immersion. And, hence, in this study, the impressions were immersed in disinfectant solutions. The chemical disinfectants used in this study are 2% glutaraldehyde and 1% sodium hypochlorite. Glutaraldehyde solutions act by fixation of the cell membrane and block the release of cellular components and thus kill the microorganisms. Sodium hypochlorite action causes cell oxidation and thus acts as bactericidal. Sodium hypochlorite has a corrosive potential on the metal trays. And, hence, the heat cure acrylic tray was customized for this study. Lepe et al. assessed the dimensional stability of elastomeric impression materials after disinfection with 2% glutaraldehyde and found that the accuracy of impressions was badly affected. Such studies proved that chemical disinfectants alters the dimensions of the impression and also leads to surface roughness, which is not desirable. And hence an in vitro study was conducted for comparative assessment of effectivity of chemical and UV disinfection on the dimensional stability of polyvinyl siloxane impressions. UV radiations of a UV disinfection unit have a powerful bactericidal effect it reacts with DNA of the cells by the initiation of thymine centenary, which leads to cell death. UV radiation has been used to disinfect water supplies, laboratory equipment such as in laminar flow hoods, rooms and halls in hospitals, dental impressions, and titanium implants laboratory handpieces. Boylan et al. assessed the ability of Buffalo UV disinfection unit. The effects of UV light on fungi and impression materials were tested by Ishida et al. in 1991. They found that UV light killed most Candida organisms within 5 min of exposure without any change in dimensions nor the surface roughness was seen in the silicone impression material. Godbole et al. in 2014, found that the UV chamber can be safely used for the polyvinyl siloxane impression material. This study evaluated the effect of a chemical disinfectant against the UV disinfectant on the dimensional stability of polyvinyl siloxane impression materials. Moreover, it was found that the dimensional accuracy was significantly affected by immersing in chemical disinfectants when compared to the UV disinfectant. Thus, disinfecting an impression with UV radiation is an easy and effectual method that protects the dentist and the dental auxiliaries who handles the impression. It also protects them from the harmful effects of the chemicals that are used in chemical disinfectants. UV disinfectant can be especially beneficial for disinfecting hydrophilic materials such as polyethers, alginate, and agar. 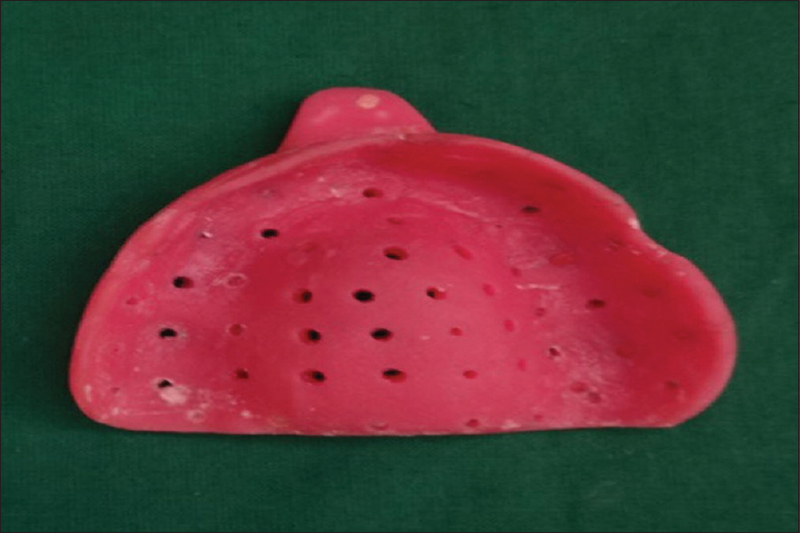 The prosthesis made from acrylic resins can also be disinfected effectively with this method. 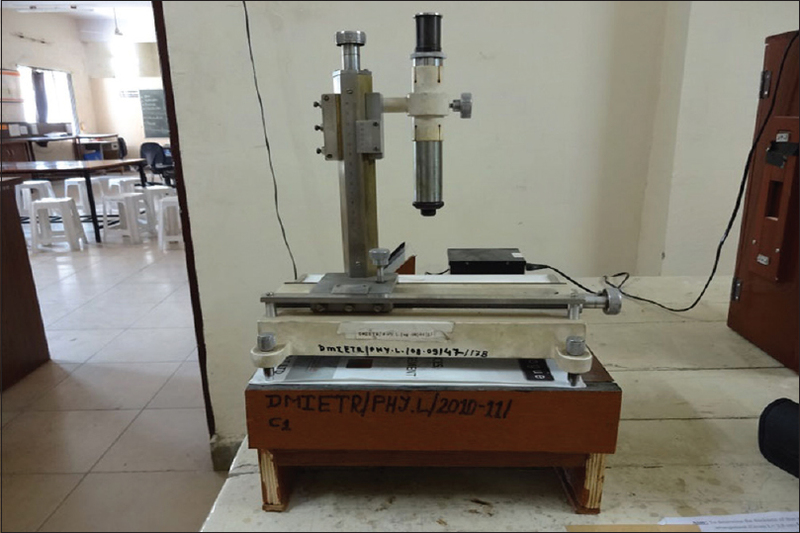 There exist a need for further research to elucidate the three-dimensional (3D) measurement to determine the dimensional stability, with a larger sample size and more advanced equipment which proved to be the limitations of this study. There is scope for further studies to evaluate the efficacy of disinfectant along with dimensional stability using more sophisticated tools such as profilometry, 3D-scanning microscopy, or confocal laser scanning microscopy for better analysis. There is growing concern about the issue of cross-infection in dental clinics and laboratories. 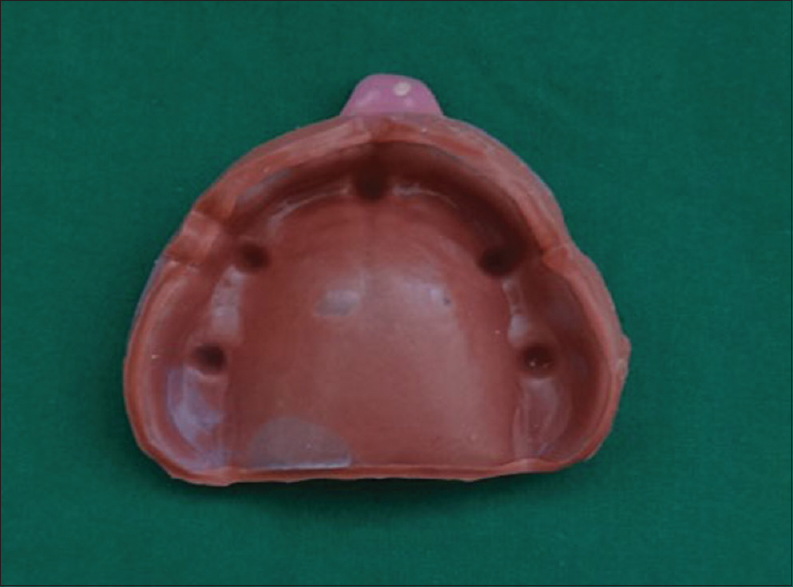 Impression making is an important aspect in fabricating prostheses. Impressions carry different microorganisms as it comes in contact with saliva and blood in the oral cavity. There are many methods of disinfection for impression material, but these conventional strategies present several disadvantages. After disinfection, it is important that impressions remain accurate and stable in reproducing the oral structures. There was a significant dimensional change in the samples between Group A (control group) with that of Group B (disinfected with 2% glutaraldehyde) and Group C (disinfected with 1% sodium hypochlorite). No significant dimensional change was noted in the samples between the Group B (disinfected with 2% glutaraldehyde) and Group C (disinfected with 1% sodium hypochlorite). There was no significant dimensional change in the samples between the Group A (control group) and Group D (disinfected with UV disinfectant unit). There was a significant dimensional change in the samples between the Group D (disinfected with UV disinfectant unit) with that of Group B (disinfected with 2% glutaraldehyde) and Group C (disinfected with 1% sodium hypochlorite). The use of effective infection control procedures in the dental office and the dental laboratory will prevent cross-contamination that may extend to dentists, dental office staff, dental technicians, and patients. And, hence, the successful practice of infection control depends on the ability to understand the need for this dynamic concept with the proper implication of method and knowledge. Marya CM, Shukla P, Dahiya V, Jnaneswar A. Current status of disinfection of dental impressions in Indian dental colleges: A cause of concern. J Infect Dev Ctries 2011;5:776-80. Rowe AH, Forrest JO. Dental impressions. The probability of contamination and a method of disinfection. Br Dent J 1978;145:184-6. 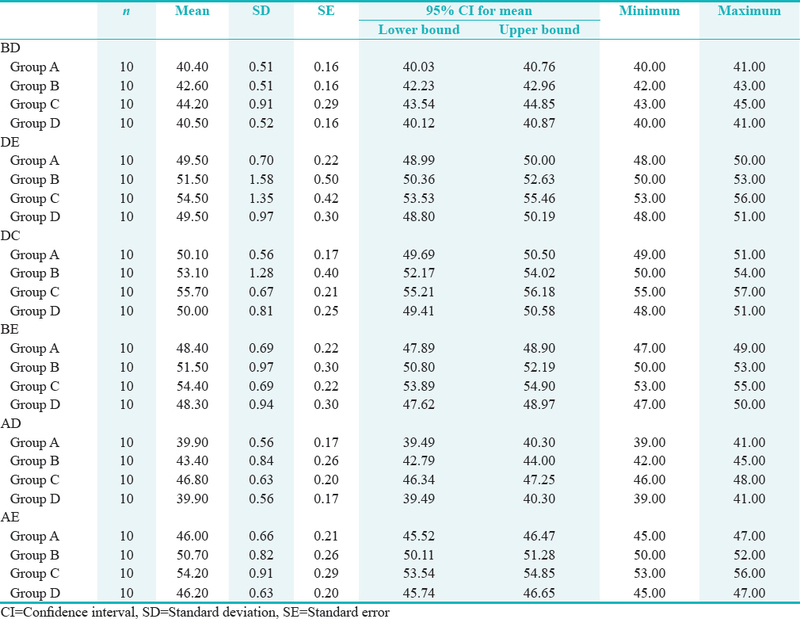 Chidambaranathan AS, Balasubramanium M. Comprehensive review and comparison of the disinfection techniques currently available in the literature. J Prosthodont 2017:1-8. Demajo JK, Cassar V, Farrugia C, Millan-Sango D, Sammut C, Valdramidis V, et al. Effectiveness of disinfectants on antimicrobial and physical properties of dental impression materials. Int J Prosthodont 2016;29:63-7. Naik RG, Dodamani AS, Vishwakarma P, Khairnar MR, Jadhav HC, Deshmukh MA. Assessment of efficacy of ultraviolet chamber in disinfecting dental instruments. J Pharm Heath Sci 2016;6:1586-9. Amin WM, Al-Ali MH, Al Tarawneh SK, Taha ST, Saleh MW, Ereifij N, et al. The effects of disinfectants on dimensional accuracy and surface quality of impression materials and gypsum casts. J Clin Med Res 2009;1:81-9. Leung RL, Schonfeld SE. Gypsum casts as a potential source of microbial cross-contamination. J Prosthet Dent 1983;49:210-1. Gupta S, Rani S, Garg S. Infection control knowledge and practice: A cross-sectional survey on dental laboratories in dental institutes of North India. J Indian Prosthodont Soc 2017;17:348-54. Pleasure MA, Duerr EL, Goldman M. Eliminating a health hazards in prosthodontic treatments of patients with pulmonary tuberculosis. J Prosthet Dent 1959;9:818-24. Aeran H, Agarwal A, Kumar V, Seth J. Study of the effect of disinfectant solutions on the physical properties of dental impressions. Indian J Dent Sci 2014;3:1-6. Merchant VA. Infection control and prosthodontics. J Calif Dent Assoc 1989;17:49-53. Rios MP, Morgano SM, Stein RS, Rose L. Effects of chemical disinfectant solutions on the stability and accuracy of the dental impression complex. J Prosthet Dent 1996;76:356-62. Badrian H, Davoudi A, Molazem M, Zare MH. 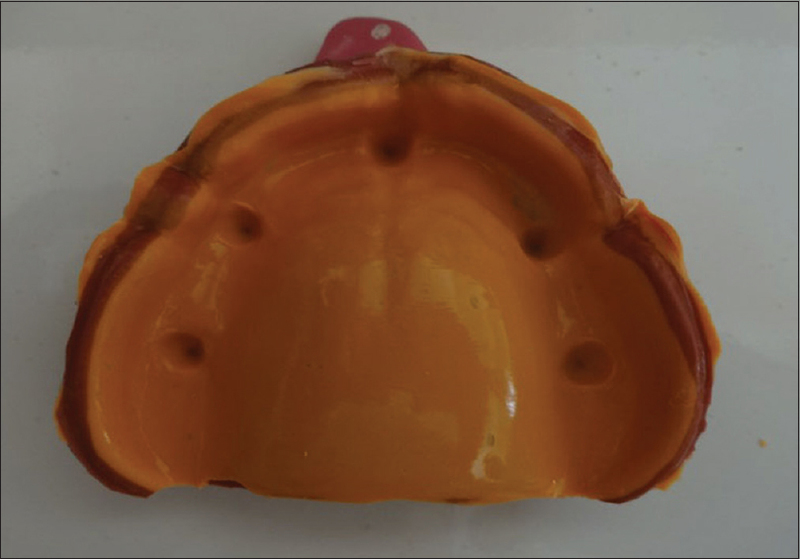 The effect of spraying different disinfectants on condensational silicone impressions; an in vitro study. J Indian Prosthodont Soc 2015;15:263-7. Vidya BS, Shetty MS, Shenoy Kamalakanth K. Infection control in the prosthodontic laboratory. J Indian Prosthodontic Soc 2007;7:62-5. Lepe X, Johnson GH, Berg JC. Surface characteristics of polyether and addition silicone impression materials after long-term disinfection. J Prosthet Dent 1995;74:181-6. Aeran H, Sharma S, Kumar V, Gupta N. Use of clinical UV chamber to disinfect dental impressions: A comparative study. J Clin Diagn Res 2015;9:ZC67-70. Boylan RJ, Goldstein GR, Schulman A. Evaluation of an ultraviolet disinfection unit. J Prosthet Dent 1987;58:650-4. Ishida H, Nahara Y, Tamamoto M, Hamada T. The fungicidal effect of ultraviolet light on impression materials. J Prosthet Dent 1991;65:532-5. Godbole SR, Dahane TM, Patidar NA, Nimonkar SV. “Evaluation of the effect of ultraviolet disinfection on dimensional stability of the polyvinyl silioxane impressions.” an in vitro study. J Clin Diagn Res 2014;8:ZC73-6.